The traditional curries of Kerala - Varuthu Aracha Curry. Common spices like coriander seeds, red whole chilly, fenugreek seeds and cumin seeds are roasted (Varuthu) by tossing in a hot iron skillet until they are fragrant and then ground to a fine paste (Aracha) with plenty of coconut to prepare the Varuthu Aracha masala. The rich aroma penetrated through your nostrils which makes your mouth water to have a morsel of the spicy curry. Varuthu Aracha Chemeen Muringikka Curry, is a speciality from the coastal side of Kerala where shrimps (Chemeen) and drumsticks (Muringikka) are available in plenty. When the curry is made you will be confused by what element is best in the curry; is it the shrimps that is so subtly infused with flavours from the drumsticks and the roasted spice gravy or is it the drumsticks that reminds you of the shrimps that you've left behind on your plate or is it the lip-smacking tangy spicy gravy that boasts of both the shrimp and drumstick flavours? 1. In a hot pan, dry roast coriander seeds, red chilly, fenugreek seeds and cumin seeds until fragrant. Set aside to cool. Roast grated coconut until it becomes dry (it doesn't have to change colour). Set aside to cool. Dry grind roasted spices and coconut until it becomes a fine powder. Add rest of the ingredients of "to grind to a fine paste" with very little water and grind till it becomes a thick fine paste. 2. Cook drumsticks in water with salt and turmeric powder until half done. Reserve the water in which it is cooked. 3. In a hot pan, heat coconut oil. Splutter mustard seeds. Add onion, ginger, garlic, curry leaves and whole chillies and stir through until onion becomes light brown in colour. Add the ground paste and stir through over medium flame until oil begins to separate. Add shrimps and salt and mix well. Cover pan and cook shrimps over medium flame. (It is not required to add water at this stage because liquid will ooze from shrimps). When shrimps are half-done, add half cooked drumsticks and water (depending on how thick or thin you want the gravy to be) and mix well. Season to taste. Continue cooking until shrimps are done to your liking. innovative idea.excellent and looks yummy. Wow something diff and delicious...yummy. Very unusal combo n nice presentation. 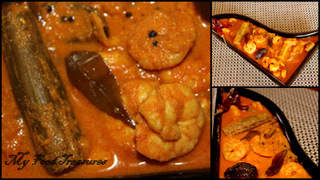 Lovely, spicy curry...I love shrimps a lot..thnx for sharing this recipe..